BYU in review: Did coach Dave Rose wait too long to give Gavin Baxter his first career start? Provo • For three halves of basketball last week — the entire game against No. 4 Gonzaga on Thursday and the first 20 minutes against Loyola Marymount on Saturday — BYU’s season appeared to be on the verge of circling the drain. Then freshman forward Gavin Baxter and junior guard Nick Emery rescued the Cougars, combining for 31 points in the second half as BYU outscored LMU 44-23 in the final 20 minutes to take a tougher-than-it-looks 67-49 win at the Marriott Center. 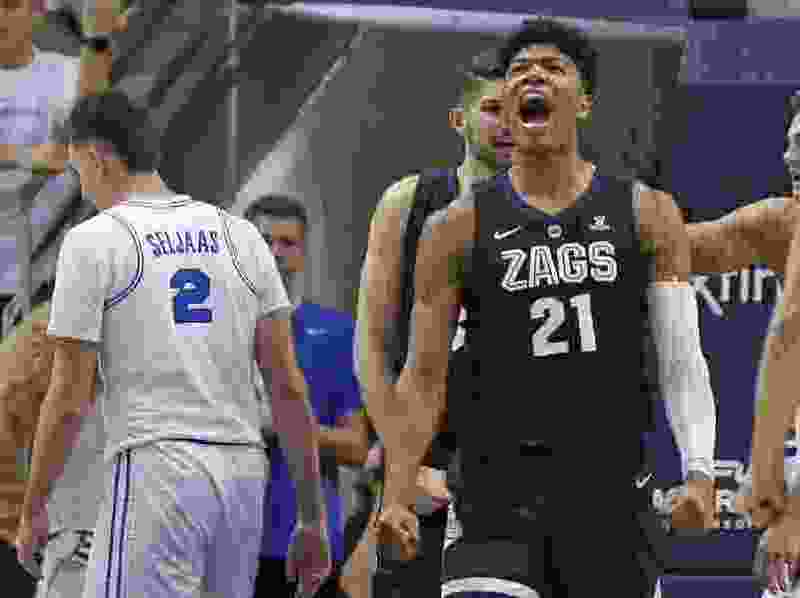 It was quite the recovery, after BYU was pummeled 93-63 by the powerful Zags on Thursday and fell behind 26-23 to the Lions in the first half Saturday. Where have these guys been all season? That was the big question, especially regarding the 6-foot-9, uber-athletic Baxter, who made his first career start and finished with 25 points and 10 rebounds, both career highs. Would the Cougars, suddenly in second place in the West Coast Conference standings with a 6-3 league record, 14-10 overall, have won more games if Baxter had been utilized more in the past? He had been playing more lately but was still averaging just 10.3 minutes per game. Emery scored a season-high 17 points and made five 3-pointers without a miss, tied for second-most attempts without a miss in a single game in BYU history. He has mostly struggled offensively since rejoining the team in mid-December, so his fluctuating minutes have been understandable. But why didn’t the coaching staff recognize sooner what they had in Baxter? That’s a complicated question, coach Dave Rose said. Baxter and Emery combined to make seven 3-pointers, six in the second half. The other Cougars were 0-for-11 from long range against LMU. * If not for Gonzaga, an all-star loaded squad that almost certainly won’t lose a league game this season, the WCC race would be quite interesting. That said, the battle for second place — BYU, San Francisco, Saint Mary’s and San Diego are in the thick of it — is ultra-important this year because the No. 2 seed gets a double-bye into the semifinals in the conference tournament. * Baxter and Emery got the accolades, but Saturday’s unsung hero was starting senior point guard McKay Cannon, who had a career-high seven assists and put the defensive clamps on LMU’s James Batemon, who didn’t score after entering the game with a 17.4 average. * While one freshman, Baxter, is emerging, another has seemingly hit a wall. Starting wing Connor Harding was just 3 of 10 from the field in the two games and played only nine minutes against LMU after logging 21 against Gonzaga. Harding hasn’t reached double figures in scoring since Dec. 12 vs. Portland State. Gavin Baxter. His play against LMU re-energized the Cougars just when they needed it most. He’s now averaging 4.0 points and 2.4 rebounds per game — modest numbers considering what he was able to do Saturday night. Connor Harding’s drive. Let’s think outside the box on this one and give it to Harding, who drove right at LMU’s 7-foot-3 Mattias Markusson and drew a foul on the big guy a minute into Saturday’s game. Markusson picked up his second foul two minutes later and his third foul late in the first half and logged only 23 minutes in the game. The Cougars head back out on the road to face last-place Portland (0-9, 7-17) on Thursday, then return home to host Pacific (3-6, 13-11) at the Marriott Center on Saturday. BYU routed the Pilots 79-56 back on Jan. 10, but games at Chiles Center are never easy and Portland features some outstanding guards in JoJo Walker and Marcus Shaver Jr.